Olivier Giroud, Aaron Ramsey and Mathieu Flamini fired Arsenal to their fifth Premier League win in a row as they moved to within one point of second-placed Manchester City with a 3-0 win over West Ham at the Emirates. 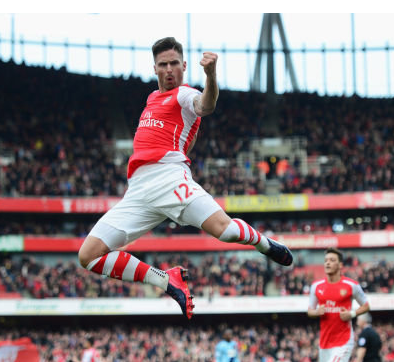 France striker Giroud – who has now scored five times in his last five matches against West Ham – struck just before half-time and then combined with Ramsey on 81 minutes for Arsenal's second before linking up with Santi Cazorla, who teed-up fellow sub Flamini for a third six minutes from time. There are fewer finer sights in football than a flowing, incisive Arsenal team goal. On Saturday, the Gunners provided three perfect examples in a confident 3-0 victory over West Ham, which strengthens Arsenal's grip on third place in the Premier League. The three star performers here were Olivier Giroud, Mesut Ozil and Aaron Ramsey, who all provided different aspects of attacking play required for these type of goals. Giroud offers neat wall passes, Ozil's penetrative passing cuts through defences and Ramsey charges towards goal determinedly. Together, they formed a triangle that outfoxed West Ham repeatedly.